Stir in the caster sugar, and then pour in the egg. Use your hands to bring the dough together. If needed, add a little cold water to help it come together. Do not over knead, this keeps the pastry short. Form the dough into a ball, wrap it in clingfilm, and chill it in the fridge for about half an hour. Next, make the Viennese whirl topping. Using a wooden spoon, beat together the butter and icing sugar until it is very soft and fluffy. Add the flour, baking powder and almond extract and mix together thoroughly. Spoon into a piping bag with a star nozzle fitted onto it. Roll out the pastry and use a cutter to cut out circles that fit your mince pie or muffin tin. Grease each hole in the tin then press in the pastry gently. Place a couple of teaspoons of the mincemeat in each pastry base. 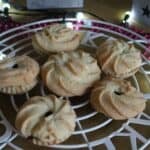 Pipe the Viennese whirl topping onto the mince pies in swirls, as if you were icing cupcakes. Bake at 180 degrees for approximately 25 minutes until the whirls have risen and are golden brown. Allow to cool, then serve cold, or warm with cream. Dust with icing sugar for that snowy effect!